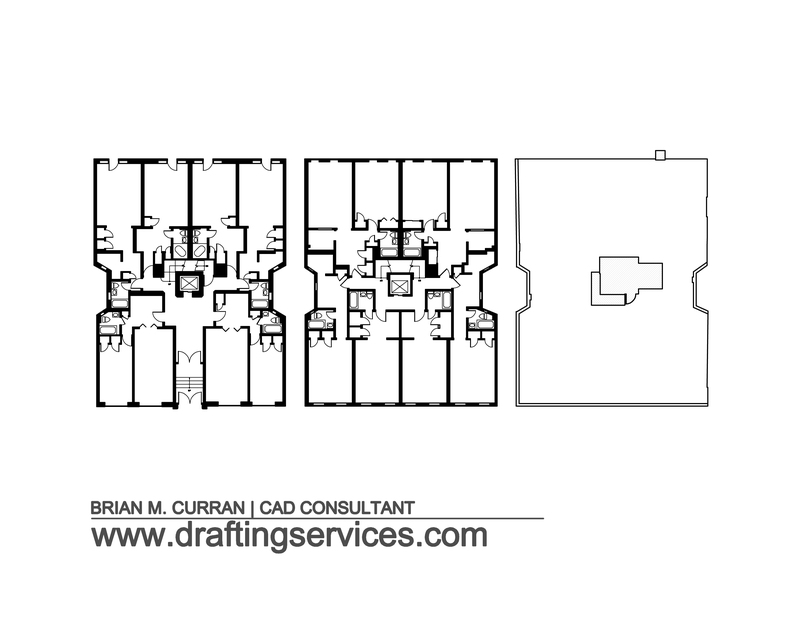 A set of as-built floor plans are drawings created from field measurements of an existing building. This blog post is the fourth post in a series of “project summary” posts that I have been writing. In this post I’ll review a past project of mine, in which I created such drawings. It was in October of 2008 that I surveyed and then created floor plan drawings of the first floor, second floor and roof of a multistory apartment building in NYC. As I’ve done in my other “project summary” posts, below I’ve listed descriptive information on the project, along with images and PDFs of my work. I unfortunately no longer have a detailed record of the breakdown of time it took me to do the individual tasks of measuring and CAD work for this building. However, I do have a record of the total time that I spent on the project, and that was 37 hours. It should be noted that the final drawings that I created for the client were more than just base drawings. What I did for the client was break up the first and second floor plans into individual apartment drawings, each with its own title block. Therefore there was additional drafting work involved, beyond merely creating the as-built floor plans in raw format, that is included in the aforementioned 37 hours. Lastly, I feel this is a worthwhile project to review, even though I only have broad data for it, and not a breakdown of where the broad data came from. Without further ado, here is the project. Type and Location: A small multistory apartment building, located on the Upper East Side of Manhattan, NY. Scope: Create measured floor plan drawings of the first floor, second floor and roof. The drawings were to be simple in nature. Access Restrictions: Limited. Keys were provided for each apartment. As-builts of the first floor, a typical repeating floor, and the roof plan. Thank you for that enlighten information on what an ‘As Built’ floor plan looks like. I am current majoring in Engineering and taking an autoCAD course this semester, so I am interested in learning what I can about the different types of designing.